Novels, poems, plays, short stories -- they all communicate meaning through the ways they use language and how the reader perceives the work as a whole. 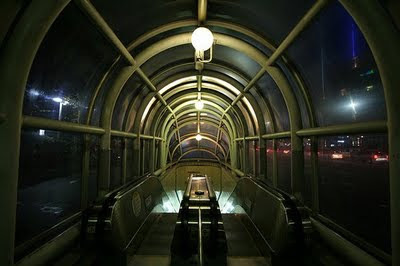 Even though they are fixed, static texts, vastly different readings and experiences are possible. Is Hamlet sane, or is he secretly crazy even though he thinks he's sane? (After all, crazy people rarely think they're crazy.) Both sides (among others) have been argued, yet it's all focused on the same text. The difference is that you, personally, will find one reading more convincing than the other. Games, meanwhile, communicate meaning through the ways they use gameplay mechanics and how the player perceives the work as a whole. Even though many of them are fixed, static spaces with only so many choices / branches, vastly different playthroughs and experiences are possible. Here's one possible (but probably unconvincing) reading of a game: In BioShock, the in-game genetic currency is called "Adam." ADAM is also a street name for the drug MDMA (aka ecstasy). You use this "ecstasy" to genetically "augment" yourself -- clearly a reference to HIV/AIDS, as shown by the widespread devastation it brings to Rapture -- to the point that you can easily murder Big Daddies, clearly a reference to the "daddy" gay sub-culture. Thus, BioShock models the devastating consequences of recreational drug use on the older generation of the gay community. Here's another one: in the Hitman series, ideal playthroughs entail social camouflage as a "silent assassin," never signaling an alarm or arousing suspicion from NPC guards. To do this, you don different disguises to allow yourself certain privileges of access around the level -- a janitor disguise lets you into the basement, the painter's disguise lets you onto the scaffolds or backstage, etc. So the best disguise is the one that allows you maximum, unhindered access throughout the level - and typically that disguise is that of the security guard / bodyguard. 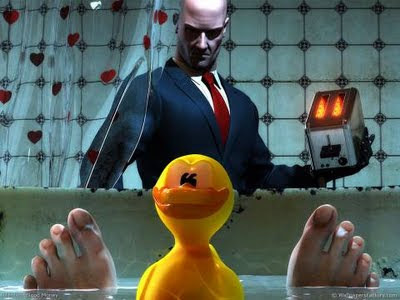 Thus, Hitman demonstrates the dangerous relationship between trust and power and how one can easily compromise the other. 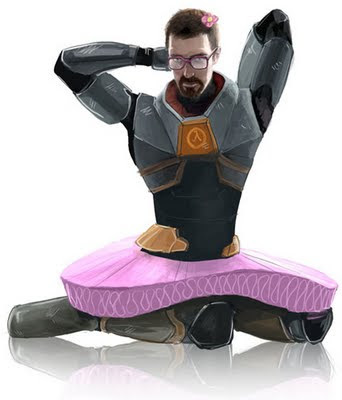 ... oh, and by the way, Gordon Freeman's gay.